In the Rose Garden / Utena fanart! Um... I looked through this thread, and didn't find one so.... I hope this is okay to post! 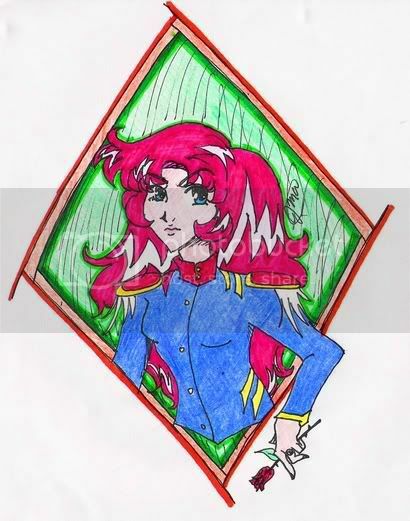 http://www.deviantart.com/deviation/37037953/ - my first Utena fanart ever! I swear, the next ones will be better! And I will draw something else beside Utena/Anthy next time. Aw, we love Utena/Anthy. At least, "we" as in the "royal We." Aw, it's cute! She looks so broody. so keep on drawing to improve! I like these markers the best too. It's also my favorite brand of colored pencil. That "Utena With Wings" is just lovely. Colored pencil? I...don't think I get that. But I have another unfinished pic of them. What I'd really like to do, is to make a few decent paintings of Akio/Anthy/Dios and Utena/Anthy/Dios, but I can't do that before the weekend 'cause I need money to get myself some acrylics. But it seems that everyone here can draw anime better than me. Being critical of your work is helpfull, but it can get you into trouble aswell. A bit of advice: Don't go complaining about your 'bad' drawing to your friends that have drawn anime for a lot longer than you have, but are on the same skill level as you. Oops. Thanks! I gotta ask--can you define "different from most" more? This is the first time anyone's said that about my anime fanart, and I'm really curious. I didn't start out drawing anime-style (as you can see on the other art pages at my site). Y'know what helped me learn the style? Direct copying. Like from manga (where you've got black-and-white line work) or the production sketches like in the Empty Movement gallery. Exact copying was the key to learning the distinct proportions used in the particular art style in Utena. Not claiming that I've mastered it, mind you, but I've definitely improved since I started drawing these characters. And then confuse yourself by learning the art style from a different series or manga artist. Switching between Utena and say, Rumiko Takahashi's style is guaranteed to make your drawing hand confuzled. yep that is how I learn..direct drawing..if you look in my begining of my gallery its full of direct drawing...and as you can see i did plenty of direct drawing of different anime soooooo i learn plenty of different styles! but dont forget to learn anatomy XD that is what screwed me the most sooo get some figure drawing books and draw draw draw! Yesyesyes! What she said! Learn anatomy and then learn how it's stylized in anime and manga. Draw from life and photos too. "We want beans, not goals." - Anon. Well, sometimes when I see someone's drawings I get a feeling that they're unique or one of a kind (though all art is), but sometimes I just sense it. I dunno why I get that feeling sometimes, it's weird. Sorry, I can't really explain myself! Hmm, I see. I haven't tried copying 'cause I've never really liked the idea. I guess I'll see about it. Or maybe I should take a look at some anime/manga tutorials. An example (a stupid one, but still an example). You don't start drawing your picture from the feet and work your way up to the head. Maybe someone does (oh my... :), but it seems as if that just makes things so much harder. Especialy if you're aiming for a specific pose. So drawing a basic skeleton and working your way with details on it seems much more easier, ne? Personaly, I always start with the head. There is a quirk, however. It's the lack of your own style in it. But that's something one of my friends explained to me. She has a unique style that people recognize instantly (if they saw it before, of course) and the same person was telling me that she built it on observing other people's styles. The more you draw, the more some minor details start changing or you start adding bits of your own style into it and before you know it... You've got your own style, new & improved, but still not a copy of someone elses. Of course, there's always exceptions and that is the reason why I'm still not too fond of anime. It just... Hmm. Oops... Nobody asked for my opinion, did they? Sorry, I just had to get it out of my system. Perhaps some of it might help. In any case, I actually wanted to post some random scribble I drew recently and ask is there anything you see as 'could be fixed' before I go and outline -> color it? Click! Great job so far. I love the part it focuses on. The hair is so pretty, and for some reason, the first think I thought when I saw it was "Squeee, so cute!". I think it's the ear. It's a really cute ear. Hey, that's really neat. Such an unusual angle to work from and yet somehow it suits her. The style is very much your own, too. The Art Institute didn't seem to think my style was developed enough. I think my mind was trying to give me my own version of the scene where Juri is looking up toward the castle when it starts raining after her last battle with Utena where her locket shattered. I love that shot SO MUCH.